Picking the “Top 10 Restaurants in Santa Fe” is no easy task with over 400-plus to choose from. Voted America’s 7th Best Food City by Conde Nast, the bottom line is that Santa Fe is a foodies dream town and a melting pot of cultural cuisine. No matter what your budget or cravings, you can dine well in Santa Fe. Dining out in Santa Fe is an experience, from contemporary fusions at a high-profile restaurant and fresh farm-to-table craft food at eclectic café, to traditional old style Mexican fare (aka norteño) and spicy tortillas from a food truck. Join us on a journey of gastronomical delights as we explore Santa Fe’s award-winning chefs, restaurants and cafés. The ultimate Santa Fe fine dining experience is to be found at the iconic Geronimos. Voted "Top 100 Restaurants in America", locals will tell you it is the most romantic and intimate restaurant in the city. From the valet parking on arrival to the warm interior of the historic adobe home with rustic chandeliers, kiva fireplaces and soft music, Geronimos exudes elegance. The Geronimo legacy lives on through the newly appointed executive, Chef Sllin Cruz, who beautifully plates sophisticated dishes such as peppery elk tenderloin with apple-smoked bacon, hawaiian ahi Tuna sashimi and mesquite grilled maine lobster tails, complimented by an award-winning global wine list and artful deserts. 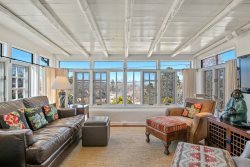 Whether you dine on the front porch in warmer months or cozy up in front of the fireplace in the bar with a signature cocktail, this is the ultimate in high-end chic and elegance. Private dining is available for groups of 24 up to 130. Many consider this folk-art filled restaurant to be the stalwart of fine dining in Santa Fe. Designed by architect Alexander Girard, this gem in the heart of Santa Fe is classy yet easy-going, intimate and inviting. Owner/Chef Mark Kiffen, recognized as the “Best Chef in the Southwest”, presents an ever-changing contemporary menu devoted to seasonal and local ingredients drawing on the flavors of both the southwest and the Mediterranean. 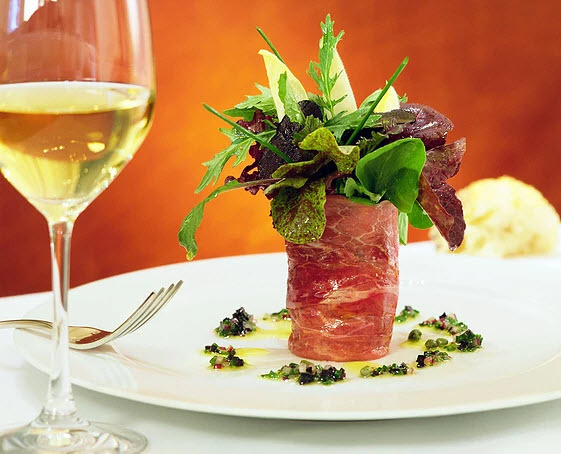 Signature specialties such as grilled beef tenderloin with foie gras, tuna tartare topped with caviar and Scottish salmon with crispy pancetta are complimented by an excellent champagne and wine list. Whether you’re sipping cocktails in the sunken bar or dining on the intimate garden patio, the same simple elegance presented in the dishes is present throughout. Heading to the foothills of the Sangre de Cristo mountains may seem a little out of the way, yet a dining experience at Terra is out of this world and well worth the drive. Enjoy romantic dining in a casual atmosphere where tall windows overlook uninterrupted sunset and mountain views, open-pit fireplaces welcome you warmly to the terrace, an extensive martini menu leaves you boggled for choice and Executive Chef Andrew Cooper serves up inventive American cuisine fresh from his own garden, or hand-picked from the award-winning Santa Fe Farmers Market. Opt for lighter bar nibbles on the terrace, signature dishes such as green chile–braised short ribs with smoked pumpkin, wilted chard, and a coffee glaze in the cozy dining room or the unique experience of dining at the Chef's Table in the restaurant's kitchen. 315’s Owner/Chef Louis Moskow is another face you will see picking up fresh produce at the local Farmer’s Market to create a menu that changes so frequently it’s written on a chalkboard! Housed in a vintage adobe building, 315 has been serving French-inspired cuisine on the Old Santa Fe Trail for more than 20 years. The classic French Bistro ambience, impressive wine list with a selection of over 400 wines, delicious cocktail creations, hearty flavorful fare and pet-friendly patio dining makes this an all-time Santa Fe favorite. It ’ s traditional Northern New Mexican cuisine with a French twist at Chef Estevan Garcia ’ s relaxed restaurant on the second floor of Hotel Chimayó. A native Santa Fean, Garcia’s charm and passion reflects in his creations, his love of wine is often a topic of conversation as he mingles with his guests and his eclectic menu is inspired by his special touch and locally-sourced cuisine. Artisanal American Dim Sum locally sourced and crafted with love! This is dining with a difference in Santa Fe where creative cuisine and mango shots are served on small plates right off a cart! A unique and fun experience where diners can choose from small plates in true dim sum style, appetizers such as rabbit pappardelle with wild mushrooms and larger plates of wild boar loin. Lodged in an intimate downtown abode, Joseph Wrede’s Culinary Pub is a delectable blend of fancy and fun. His approach of “take the world as your palate and source it locally” takes shape as southwestern classics are reinvented with innovation and flavor such as the steak au poivre, New Mexico lamb lollipops, rabbit lasagna, and duck-fat French fries that dominate the innovative bar menu. A warm, inviting, unique and nourishing culinary experience. Jambo means "hello" in Swahili and Owner/Chef Ahmed Obo welcomes you with an eclectic mouthwatering menu of exotic African comfort food with a fusion of Caribbean. One of Santa Fe’s newest award-winning ethnic restaurants, the flavors of coastal Kenya emerge in dishes he learnt from his mother such as Moroccan lamb Stew and Caribbean goat stew or a flavorful tongue sandwich from the food truck. A creative and colorful eatery serving up culinary magic at a reasonable price. Earning the 2017 title of “Restaurant of the Year”, Arroyo Vino is an outstanding farm-to-table bistro and wine shop on Santa Fe’s western mesa. Chef Colin Shane delivers an artful presentation of contemporary American fare in a small-plate format using fresh ingredients from his own two-acre garden plot and on-site greenhouse. Tables are set around a central wine bar and the wine shop with over 800 bottles, ensures there is always the perfect wine to accompany your meal. Santa Fe Bite is a great burger joint with their iconic mid-blowing Green Chile Cheeseburgers featured in endless Santa Fe travel guides. Designated a Culinary Treasure by the New Mexico Tourism Vacation & Travel Guide, the walls of the 80-seat dining room are lined with old tin signs, the chuck and sirloin are ground fresh daily and the eye-watering and mouth-watering burgers are a must! If you are not a burger fan their expanded menu offers tacos, soups and sandwiches. Owner/Chef Martin Rios is somewhat of a culinary celebrity in Santa Fe, having been on both the Food Network and Cooking Channel as well as being nominated five times for the James Beard award. Here in Santa Fe he has created a chic yet casual dining experience at Restaurant Martin. Award-winning "progressive American cuisine" is blended with Asian and Southwestern influences, complimented by a carefully chosen wine list that draws a large and loyal local clientele as well as many visitors to this top-notch eatery. Chef Matt Yohalem has been charming food lovers with creative Italian cuisine in this crowded, popular and award-winning trattoria for over 20 years. Boasting an authentic Italian Farmhouse décor with a custom wine cave, wine bar and cozy sidewalk café, Il Piatto is charming and if you visit during their afternoon and late night happy hour, it’s great value for money. Fancy some rabbit with purple potatoes and Tiramisu to die for? Come on in! Famous for its red and green chile-covered enchiladas, The Shed is an award-winning destination for that authentic lunch or dinner chile fix half a block from The Plaza. Serving up traditional Mexican fare since 1960, The Shed’s warren of unique, charming rooms is often crowded and buzzy so expect a short wait. The Shed’s less expensive sister restaurant lies a little of the beaten path but is worth the trek for traditional and tasty local New Mexican fare. It’s all things chile at the legendary La Choza with delicious enchiladas, spicy fish tacos, chile pozole soup and stuffed hatch green chilies. So, settle in on the casual patio with a signature Sangre de Cristo Margarita in hand and sample some of the tastiest local fare in town! You know it’s great when the locals love it! In a culinary destination such as Santa Fe, we knew we couldn’t pick the Top 10 Restaurants! It is emphatically impossible! Here are some more great eateries to add to your Santa Fe food itinerary. Cheers to the best of the rest! An exciting fusion of Latin and European cuisine awaits at this elegant romantic restaurant at the Inn of Anasazi. In a world of Mexican cuisine, Back Road Pizza adds a little diversity but be sure to try the Mexican Green Chile pizza chased down by a local brew on tap. Around for nearly 40 years, this is a true Santa Fe favorite where locals and tourists alike line up to sample the mouthwatering creations of Katharine Kagel. An eclectic and cheerful favorite with colorful tiles, murals, folk art and a fun communal table to share great Mexican cuisine with a touch of Asia. Dine alfresco on the rooftop of the Coyote Caf é . There is no better place to watch a sunset with a true Santa Fean vibe and contemporary and creative New Mexican cuisine. Looking for a quick stop for a burger or BLT? Dr. Field Goods is the place. Unassuming, yet a Santa Fe dining experience with a difference and the tastiest salsa in town. Another great colorful Santa Fe tapas spot with over 30 tapas and starters, live entertainment and flamenco shows. If you ’ re heading north of town to explore the sites of nearby Taos, then Gabriel ’ s is a great place to stop en route for some tasty New Mexican offerings on their scenic patio with awesome mountain views. Chocolate is a meal, right? Well it sure is at the Kakawa Chocolate House, named one of the top most luxurious places in the world to drink hot chocolate, together with heavenly chocolate truffles and Aztec brownies, of course. Whether you choose to settle in the intimate La Boca or head out to the bustling tavern at Taberna, you can expect great an authentic Spanish experience with the best tapas in town. Settle into the central atrium at the historic Hotel La Fonda on the Plaza for a sophisticated New Mexican meal surrounded by hundreds of painted glass window panes, a glass ceiling and décor of a bygone era. If it’s authentic New Mexican cooking you’re after, Maria’s is the place to go. You may spot Robert Redford as it’s rumored to be his favorite spot in Santa Fe. Authentic and refined South Indian cuisine is served up by Chef Paulraj Karuppasamy at Paper Dosa. After hosting weekly pop-ups in Santa Fe, Paulraj and his wife Nellie have found their home and have been drawing enthusiastic crowds ever since. Everyone loves a good pub grub along with a local craft beer and it ’ s all happening at Second Street Brewery in the Railyard District. A meeting place for locals since 1948, this classic diner-style restaurant is family-owned serving hearty and generous meals in a relaxed environment. Tia Sophia ’ s is the place to be for true southwestern breakfast but expect a wait as it ’ s a true Santa Fe favorite with tourists, locals and celebs alike. Right next to the New Mexico Rail Runner train depot, Tomasita’s is and experience of New Mexican classics! Top-notch green chile, legendary blue corn enchiladas and their delicious margaritas are a must as you toe tap to a little Mexican folk music. It’s all hip and happening at the Tune-Up Café, a funky and casual café with a touch of Salvador and sake cocktails! If you think salad is all about lettuce, a visit to Vinaigrette will change your mind. Locally grown produce is creatively combined into unique and interesting salads in the perfect dog-friendly courtyard setting.